Jew's Mantle (Kerria japonica): growing, planting, caring. Golden-yellow flowers in the Spring! Kerria japonica is the sole species in the genus Kerria, in the rose family Rosaceae native to China, Japan and Korea. It is a deciduous shrub growing to 1–3 m (3.3–9.8 ft) tall, with arching stems, alternate, simple, 3–10 cm long leaves with a doubly serrated margin, and golden yellow, flowers evenly-spaced along branches of new green growth. Two popular cultivars are 'Golden guinea' and the double-flowered 'Pleniflora', sometimes known as bachelor's buttons. The jew's mantle is a shrub with vigorous growth, very abundant, with slender stems always green, with deciduous and toothed leaves, flowers with 5 petals for the type species, a deep yellow. 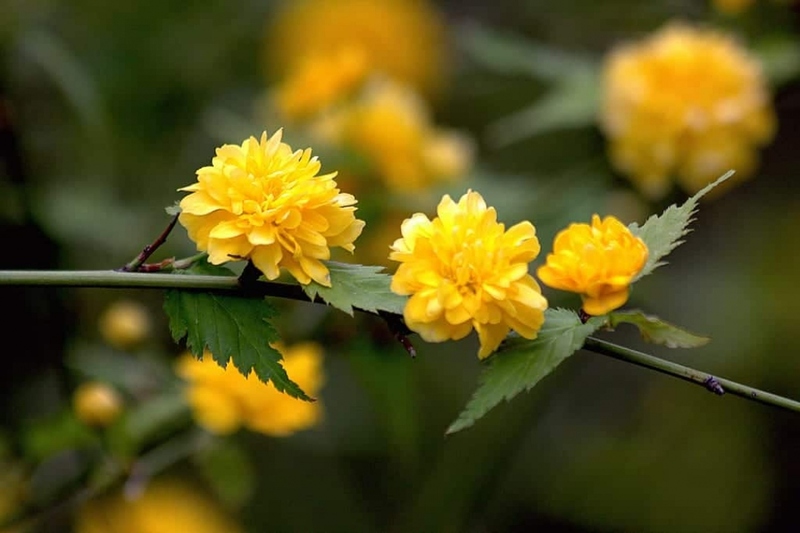 It is especially the variety with double flowers (Kerria japonica pleniflora) that is cultivated in our gardens. Plant your jew's mantle early in the fall or spring, avoiding freezing periods at all costs. You can cultivate it in a pot, on a terrace or balcony, provided you provide a potting every 2 or 3 years, at the same season. The jew's mantle is not very demanding. After the first season, it will tolerate a few omissions of watering if it is in open soil. Water once or twice a month in containers or pots - depending on the mulch thickness. Trim right after flowering, as much as you want to obtain a nice shape. Mulch your corestals before winter to protect the roots from the cold, prevent the growth of weeds and bring organic matter to the soil. You should repeat the mulching in May. The Japanese kerria emits suckers: take away some of them in the autumn and replant immediately in a light soil ! Repot your jew's mantle every two to three years in early fall or spring, avoiding frost at all costs.